Recently published research from The University of Southern Denmark and the Danish Cancer Society shows a connection between one of the most common medications for hypertension and skin cancer. Once again, Danish researchers set their sights on antihypertensive medicine containing hydrochlorothiazide, in relation to an increased risk for skin cancer. The researchers have previously demonstrated that the medicine, which is one of the most commonly used drugs worldwide, can increase the risk of lip cancer. In a new study, the researchers have identified another clear connection between the use of hypertension medicine and the chance of developing skin cancer. More specifically, this refers to drugs containing hydrochlorothiazide and squamous cell carcinoma. The researchers have also looked at other commonly used hypertension medicines, but none of them increased the risk of skin cancer. “We knew that hydrochlorothiazide made the skin more vulnerable to damage from the sun’s UV rays, but what is new and also surprising is that long-term use of this blood pressure medicine leads to such a significant increase in the risk of skin cancer,” says Anton Pottegård, Associate Professor, PhD, from the University of Southern Denmark, who is the initiator of the study. The study, which is based on about 80,000 Danish cases of skin cancer, shows that the risk of developing skin cancer is up to seven times greater for users of medicine containing hydrochlorothiazide. 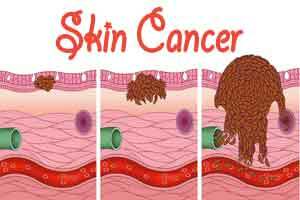 There are several types of skin cancer. And squamous cell carcinoma, which the blood pressure medicine is now associated with, can luckily be treated and has a very low mortality rate. “However, both lip and skin cancer are typically treated with an operation that is associated with a certain risk of impairment as well as a small, but real, risk that skin cancer of the squamous cell type spreads,” explains Anton Pottegård. Hydrochlorothiazide is one of the most commonly used medicines to reduce blood pressure both in the US, where over ten million people use the drug annually and in Western Europe. The side effects can, therefore, affect numerous people, and the researchers have calculated that about 10 percent of all Danish cases of squamous cell carcinoma may be caused by hydrochlorothiazide. “You should not interrupt your treatment without first consulting your doctor. However, if you use hydrochlorothiazide at present, it may be a good idea to talk to your doctor to see if it is possible to choose a different medicine,” says Anton Pottegård. As part of the project, the Danish researchers partnered with Dr. Armand B. Cognetta Jr., Chief Division of Dermatology, Florida State University, who is the head of one of the largest treatment centres for skin cancer in the US. Dr. Cognetta has extensive experience in diagnosing and treating skin cancer patients in Florida, and he has noted that hydrochlorothiazide is suspiciously prevalent among his patients, particularly among so-called “catastrophic patients”, who can have several hundred skin cancers each. He welcomes the new results. “We have seen and followed many patients with different skin cancers where the only risk factor apart from exposure to sunlight seems to be hydrochlorothiazide. The combination of living and residing in sunny Florida while taking hydrochlorothiazide seems to be very serious and even life-threatening for some patients. Even though we knew that hydrochlorothiazide made you sensitive to the sun, the connection between this medicine and skin cancer has remained elusive. The study carried out by Pottegård and his colleagues will have great impact on skin cancer prevention and public health world-wide,” he explains. The researchers continue to work on studies that can shed additional light on the connection between hydrochlorothiazide and skin cancer. Furthermore, they have entered into a dialogue with relevant medical companies as well as the Danish Medicines Agency regarding their findings. “The risk of skin cancer must, of course, be weighed against the fact that hydrochlorothiazide is an effective and otherwise safe treatment for most patients. Nevertheless, our results should lead to a reconsideration of the use of hydrochlorothiazide. Hopefully, with this study, we can contribute towards ensuring safer treatment of high blood pressure in the future,” concludes Anton Pottegård.